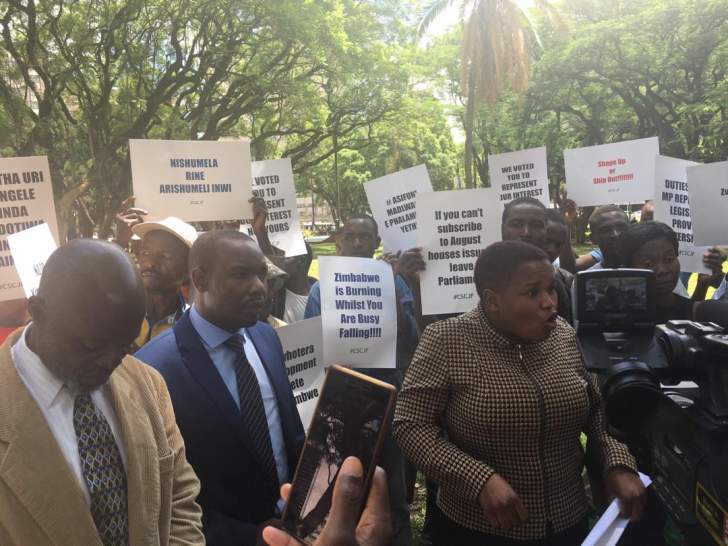 There was pandemonium in parliament on Tuesday when angry MDC Youths clad in party regalia came and beat up some petitioners whom they accused of belonging to one of the factions in the MDC-Alliance. Members of the Civil society groups and churches had stormed Parliament to petition the Speaker, Advocate Jacob Mudenda to punish rowdy Members of Parliament who are taking parliament business for granted. The citizens under the banner of Civic Society and Churches Joint Forum were led by self styled Bulawayo based pastor Anglistone T. Sibanda. We the citizens of Zimbabwe who turned out in large numbers across the country to exercise our constitutional right and mandate to elect representatives into the August house on the 31st of July 2018. Concerned by the wanton transformation of our esteemed decision making house into a caricature and house of theatric performances. Worried by the abuse of our hard earned money that we pay as taxes to support the welfare of our elected officials that is being wasted because they are not serving the purpose of instead citizens feel shortchanged if our representatives prove to be priotizing their party interest in parliament ahead of national interests. Further disturbed that our communities are being disenfranchised, neglected and marginalized by the behavior of the people we elected to represent us who are wasting our votes, our trust and indeed our efforts towards building a democratic society by not representing us. Perturbed by the denigration, insults, abuse of each other by the members of the August house while we grappling with Gender Based Violence and other forms of violence that make us a primitive society. The abuse of each other right on camera by our legislators reflects badly on our societal values of tolerance, respect and dignity and projects us as a rowdy and lawless society. We note with concern the legitimacy illegitimacy question that has taken the centre stage in Parly and wish to remind our Honourables that parliamentary seats and infact parliament has no such battles on record ,its unfair to hold the Parly over a borrowed battle. What made us send you to Parly is policy business ,reforms and to focus on delivering you election promises not otherwise. Mr Speaker sir. May we remind each other that the issue of legitimacy was closed by the highest court in the land when a ruling was made after the disputed Presidential election, the parliamentarians in unity moved on to take oaths of office in terms of the very constitution which endorsed the President. We as citizens take it that the decision by the Constitutional court is binding as directed by the constitution, hence anyone who is rejecting the decision is by default in contempt of the Constitutional court. In the spirit of promoting the rule of law, Mr Speaker sir, we note that some members of the august house are technically in violation of the law while purporting to be fighting for the restoration of the rule of law, according to us, they are breaking the law in the very place where laws are made thus contradicting themselves. We are concerned that the people we elected to represent us are sacrificing our developmental challenges and issues on the alter in preference to lamenting on behalf of their Presidential election losing candidate and as such feel that our rights are being violated and we are taken for granted. Mr Speaker sir. We are aware that party regalia is not allowed in parliament, but we note with concern that some members of the August house come into parliament putting on party regalia, not in the physical sense but in the attitude and behavioral sense. When we, the citizens watch the debate we easily tell who is from which party and that is against the standing rules and orders Mr Speaker Sir. With respect to the whipping system, we believe that the concept is working against us and fueling parliamentary polarization and tensions, promoting party position over our issues as the electorate and therefore violating our right to be represented. 1. The Committee on standing orders speedily review the code of conduct for parliamentarians and come up with strict punitive measures against rowdy behavior in Parliament. 2. The Committee on Standing Rules and orders protect the public interest by whipping all MPs into National Agenda as expected by the constitution . 3. Redefine Party regalia that not allowed in parliament to include partisan behavior that is disruptive to the proceedings in the house. 4. To revisit the whipping system that takes away the independence of our elected officials and capture them into party surrogates and infringe on our right to be represented as citizens. We have strong belief that Zimbabwe can become a leading nation with a growing economy when we depoliticize and depolarize our institutions, transform our mindsets, change our politics into development economics and move into a dispensation of a developmental trajectory for the benefit us the ordinary citizens. We demand that our lawmakers immediately put off their political party jackets and re commit to the national cause and desist from deriving non Parliament Agendas/battles into the August house. We anticipate a radical and robust intervention and response on our concerns stated above.